This wind power generation system is connected to an existing power system using a power conditioner. It therefore has no battery and cannot be used without a power grid. If you want freestanding load operation that uses a battery or other storage system, please choose a different series. The power output through the power conditioner is single-phase three-wire 100/200V (50/60Hz). A power conditioner is available for those who wish to have triple-phase output. Please inquire. 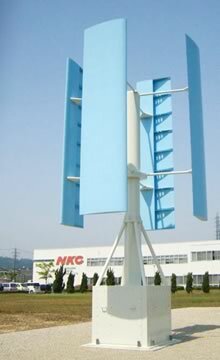 The power generated by the wind turbine generator is converted from AC to DC by a rectifier, and is boosted to the power conditioner’s operating voltage by a DC/DC converter. The boosted power is converted from DC to single-phase three-wire AC (100/200V) by the power conditioner, and is interconnected to an existing power grid and used as ordinary commercial electricity. Both the DC/DC converter and power conditioner have power load adjustment on both the input and output ends to supply power to the grid that matches the wind speed. This system is comprised of two types of brakes – an electrical brake that controls rotation when the wind speed exceeds the system’s rated speed in order to continue generating power and a mechanical brake for ensuring safety. When the turbine rotates faster than its rated speed due to sudden changes in wind speed such as gusts, a signal from the voltage detector (VD) causes the electrical brake to operate, thereby decreasing the rotation. When the turbine’s rotation drops below its rated speed, the electrical brake is automatically released. If further overspeed occurs, a signal from the voltage detector (VD) or speed detection unit (SDU) causes the mechanical brake to operate, stopping the turbine’s rotation. This mechanical brake provides safe operation of the system in the event of a failure of the DC/DC converter or power conditioner, or during a power outage of the control source. For maintenance, the electrical brake can also be applied manually to stop operation.